Alexander Elliott Miller is a composer, guitarist and educator whose music has been described as “wild….unearthly…lyrical…a voice worth listening to” (San Francisco Classical Voice) and “deceptively laid back…inventive….unconventional” (Mark Swed, LA Times). His compositions have been performed by Grammy-nominated musicians including Tony Arnold, Vicki Ray, Aron Kallay and the Los Angeles Percussion Quartet, and ensembles including Earplay New Chamber Music and the Boston New Music Initiative. 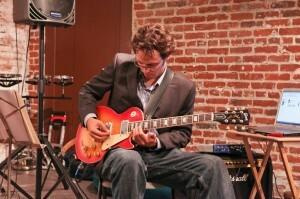 Miller has collaborated, either as a composer or electric guitarist, with organizations including the Hear Now Festival, Carlsbad Music Festival, Long Beach Opera, People Inside Electronics, and received honors including an Earplay Donald Aird Composers Award and a MacDowell Fellowship. Currently, he teaches theory and composition at California State University Long Beach and Chapman University. He holds degrees from USC, Eastman and the University of Colorado at Boulder.